Gardeners are such generous people! Over the years I have been given so many plants, cuttings and seeds. It actually makes my garden so much more interesting when I see the plants and remember the person behind the gift - somehow gives the plant more personality than those that were bought at a garden centre. I can't actually hand-on-heart say that I have never stolen a surreptitious cutting but it has been very rare - the occasion - not the plant, I hasten to add! Generally if you ask, most gardeners will usually give you a cutting or even dig up a small piece. Variegated Ricinus - anyone know its correct name & is there a commercial source? Just this last week I have been reminded of this generosity. An unknown gardener from the USA contacted me regarding a variegated Ricinus he had seen described on the Hardy Tropicals UK site and asked me if I could find out the seed source. Now as a lover of variegated and coloured leaved plants, this immediately had my heart racing! 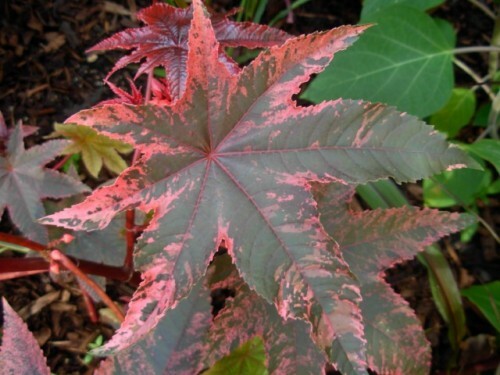 I tracked down the post describing the plant and found a picture of a dark leaved castor bean with pink edged leaves - lovely! But I failed to find any seed sources for this. A personal message to the forum member describing the plant, resulted in a generous packet of seed which I was able to split, sending half to the original enquirer in the USA. Two very satisfied gardeners! But the story doesn't end. The American gardener asked if there was anything I wanted in exchange. Now just a few weeks ago, when still in the USA I had seen a lovely dark-leaved beet in the gardens at Disneyland. This was just like the old 19C 'McGregor's Favourite' which is no longer available in the UK. (I hasten to add I don't recall back to the 19C but this was still available in the 1980's) Disney informed me it was sold by Burpees as 'Bull's Blood' which is confusing as there is another inferior cultivar sold under that name. 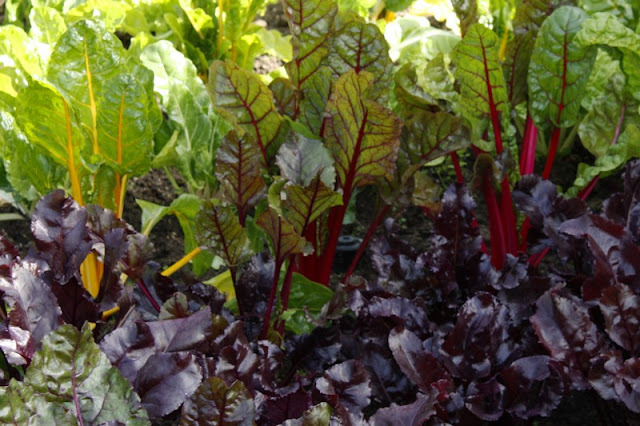 Anyway, my American sleuth has tracked down several dark leaved beets which he has ordered for me and promised seed of a black leaved cotton, Gossypium herbaceum 'Nigrum' which also sounds exciting. And just this morning the first of the variegated Ricinus has germinated. So if Di or Rick happen to read this - thanks again guys and Di - I owe you - if you want some black-leaved cotton, just let me know. 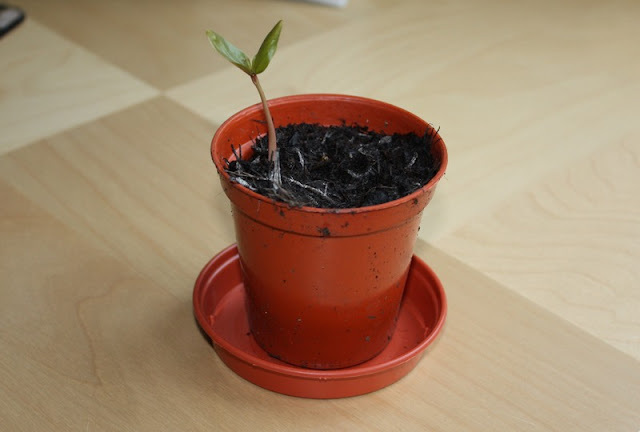 And it all fits in with the basic premise that if you want to conserve a plant - give it away! On the Hardy Tropicals site it was first mentioned by Simon from Slough who called it Ricinus 'Bloem Paul D'Hont' and said it was Dutch. I'll grow at least one in a pot and leave with a friend when I return to the USA. I know he'll save some seed for me and other who have asked! I have been looking for a variegated Castor Bean for about 10 yrs now if you have a lead on any seeds for me let me know! I am hardytropicalguy and am at gmail and yahoo.com Thanks Happy Gardening!!! So want to find this variegated castor beans.Are there any source's too buy them ? sorry - no known commercial sources but it seems to be circulating amongst plant collectors. Just search around.